We are currently off our bike on doctors orders so are filling in the gap with this video shot from our bedroom and balcony as the old factory next door bites the dust. Not surprisingly we eagerly await a heavy rain to wash said dust off the house. 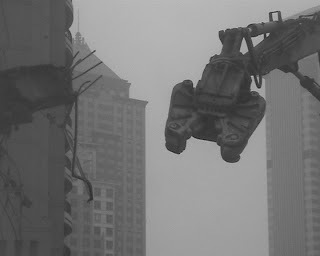 The price of steel is so high in China now that it is worth paying seven guys and an excavator for three days to extract all the rebar from the rubble to be sold as scrap. Staying Put – for now. 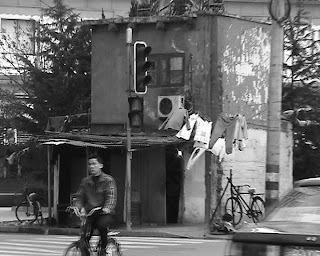 All the recent media attention on the Chongqing nail house reminded us of two similar Shanghai cases just around the corner. The first one promptly disapeared the next week but the half-a-house across the road remains intact with its tennants still running their sugar cane distribution business from the kitchen. Both these houses used to be part of streets that were demolished to make way for the high-rise development behind. Hello?…hello? yes…I’m on a bike…hello?…what?… Yes, I’ll be..hello?… home for dinner…Yes…hello?… noodles sounds goo… Oh bugger! In another sign of the times we spotted this guy in a wicker hardhat and realised that we haven’t seen one in years. 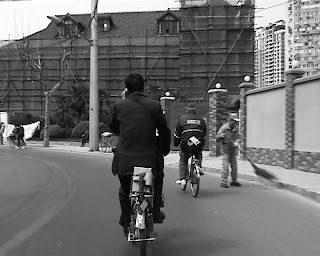 Back in the 90’s these were an everyday sight but in Shanghai at least they have been largely consigned to history. 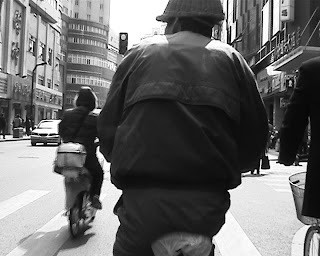 Is a bell necessary on a bicycle? 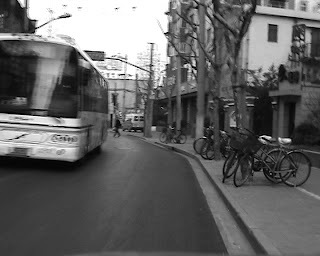 Van pulling out, overtaking a cyclist, overtaking a cyclist, jaywalkers, pedestrian in the road, pedestrian in the road, scooters and cyclists rubbernecking a cop giving a ticket, van reversing into traffic, pedestrian in the cycle lane, scooters trying to jump a red light, overtaking a cyclist, overtaking sporty kid on a bike who can’t believe a forty-something white guy is going faster than him, scooters jumping a red light, two cars and a scooter turning into oncoming traffic, scooter coming out of the sun on the wrong side of the road, a wheelchair and two more jaywalkers. Isabel necessary on a bicycle? She certainly is! We usually keep clear of buses anyway but this one was on a mission! 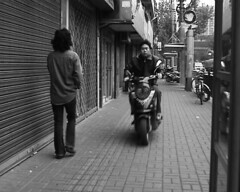 Guangzhou city in the south of China banned the use of horns 2 years ago and we keep waiting for the same ban to be enforced in Shanghai. Who was he tooting at anyway? 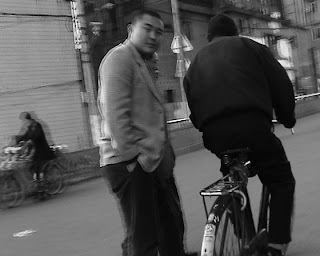 The road was empty apart from me and I don’t think he even noticed me on the bike. The best theory we have is that his shift is nearly over and he wants to get back to that oldest established, permanently rolling, mahjong game at the depot.